The conversion of forests to agricultural crops impacts these ecosystems, causing negative changes in the biological, physical and chemical soil attributes. Agroforestry systems (AFs) represent an environmental sustainable alternative that can bind healthy food production and nature conservation. Litter production and decomposition are key roles to carbon and nutrient cycles in the tropics, as the main sources of nutrients for plant growing. 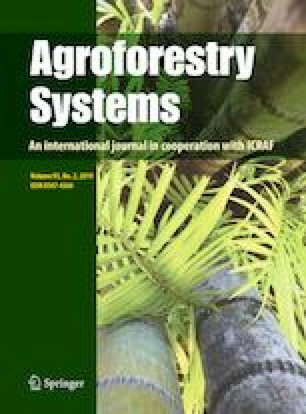 The aim of this study was to quantify the amount of leaf litter accumulated aboveground and its contribution to nutrient return through decomposition process in 5- and 10-year multistrata successional agroforestry systems (AF5 and AF10) as compared to 10-year natural regeneration areas (NR10) at Brazilian Atlantic Rainforest Biome. Greater amounts of standing litter were observed on AF5 (61 Mg ha−1) as compared to AF10 (45 Mg ha−1) and NR10 (39 Mg ha−1), with leaf contribution of 17% (AF5), 25% (NR10) and 30% (AF10). Leaf decomposition was performed using litterbags, and all curves were fitted to a double exponential model for remaining mass, C and Mg and to a single exponential model for N, P, K and Ca. The half-time life of decomposing leaves varied from 173 days (NR10) to 289 (AF5) and 301 days (AF10), and the half-time mineralization of nutrients varied from 15 (N on AF5) to 257 days (K on AF10). Despite their low contribution on total standing litter, leaf fraction is able to return at least 100 kg ha−1 N, 5 kg ha−1 P and 10 kg ha−1 K to soil of multistrata agroforestry systems, reducing NPK external inputs dependence to small farmers. Extract from Daniel Kramer Schwiderke M.Sc. dissertation—Soil Science Postgraduate Programme of Federal University of Paraná, Curitiba, Paraná State, Brazil. The authors would like to thank to: Projeto Agroflorestar (Programa Petrobrás Ambiental); Projeto Agroflorestas (Embrapa); and all small multistrata agroforestry farmers: Nardo, Dolíria, Sezefredo and Sidnei (all of them associated to Cooperafloresta).